I’d add that history is written by the powerful, and history is written by the literate. I recently finished reading Sharyn McCrumb’s novel Ghost Riders , and in her author’s note at the end of the book, she points out that it is the influential members of society that usually write down history. In her context, she’s discussing the U.S. Civil War in the mountains of North Carolina, and she notes that even when the war was done, some of the people there kept fighting because this was a personal war, where people took sides from house to house, not region to region. Her point is that most people don’t see the Civil War from this perspective. In the mountains, the war was not fought grand swaths of experience – but between neighbors and friends. Hence, lingering . . . still. The same is true of slavery. Often, we talk about IT like this experience was general – and general is often abstract, and it’s always impersonal. But slavery was personal – from person to person, life to life. But because history is written by the powerful and the literate, when we look back at American chattel slavery, we are – for the most part – looking through the lens of privilege – whether it’s the privilege of the Daughters of the Confederacy, who wanted to shine a “better” and very distorted light on the Civil War* or whether it’s our privilege of 21st century hindsight that gives us the grace of years when we look back. Whatever our privilege, when we read about slavery, we are often not seeing the experience of slavery through the eyes of people who were enslaved. It does us well to remember this here in the 21st century. It does us well to temper . . . to outweigh the voices of scholars and historians with the first person accounts of enslaved people, the few we still have with us. 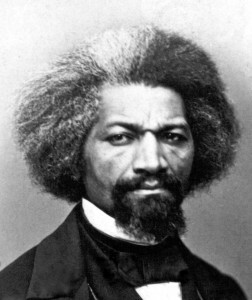 Many of us – if we attended American public schools – read at least segments of Frederick Douglass’s amazing Narrative, but we are missing an amazing story and the words of a powerful writer if we don’t read the whole thing. We need to read the stories collected from former slaves by the WPA, and if we can, we should listen to the recordings – to gather in the beautiful, hard-won voices of these people. We can read Solomon Northrup ‘s amazing tale that is now captured so powerfully in the film with the same name, 12 Years a Slave. Plus, we need to read Harriet Jacobs’ story – an even rarer gem than even the rare slave narratives because it is written by an enslaved woman. The powerful, the victors, those allowed to be literate – these are where we often get our stories – of slavery and of history in general. It’s time we recognized that our own knowledge is skewed toward the victors . . . and to the detriment of those whose voices were often deliberately silenced and obliterated. Reading slave narratives is one way we can let their voices echo and change our understanding of history . . . and our understanding of ourselves and our neighbors. I only wish I had more of the writings of the people enslaved at my home place. What a thing it would be to read about Primus’s experience. What slave narratives have you read? How did they affect how you understood the personal experience of slavery? *If you’d like to read the full document published and propagated by The Daughters of the Confederacy – The Truths of History by Mildred Lewis Rutherford – you can order it through the Confederate Reprint Company. A caution though – the site made me very sad and a little angry. ** It’s definitely worth a visit to read the introduction to the Slave Narrative Collection at UNC. They give a wonderful description of just why these writings matter so very much.